Antelope Beads is having a contest I just couldn't pass up. Their challenge was simply to use at least three Bulahan Beads in a jewelry design. Given the range of beads choose from, including different types of wood, seed, bone, horn & hoof, I thought it sounded pretty fun. If you follow my ramblings at all, you probably know I've been on an owl jag here lately, so I thought to myself, "Sherri, why don't you try mixing the Bulahan beads with an owl design!" Sometimes I do that, you know - talk to myself, I mean. Don't tell anybody. I ordered a selection of fun beads to inspire me. The flowers are Salwag seed, as are the round beads. The ones with the white surface showing are Buri seed. I decided to use the flower shaped ones for some owly eyes and then mix all of the shapes in the necklace strap. For the owl, I used cord in turquoise and teal as well as white and brown. I used a few Czech glass beads and some crystals in with the natural beads for the necklace, then added a toggle clasp I made myself. See those rings on the end of the strands in the photo of the beads? I used one of them for the ring part of the clasp and made a toggle bar with a piece of wire. (I'm feeling pretty clever about that one!) I really like the way this necklace turned out, but I was afraid the busy owl sort of stole the attention away from the Bulahan beads, so I made a second necklace. This one really pops! 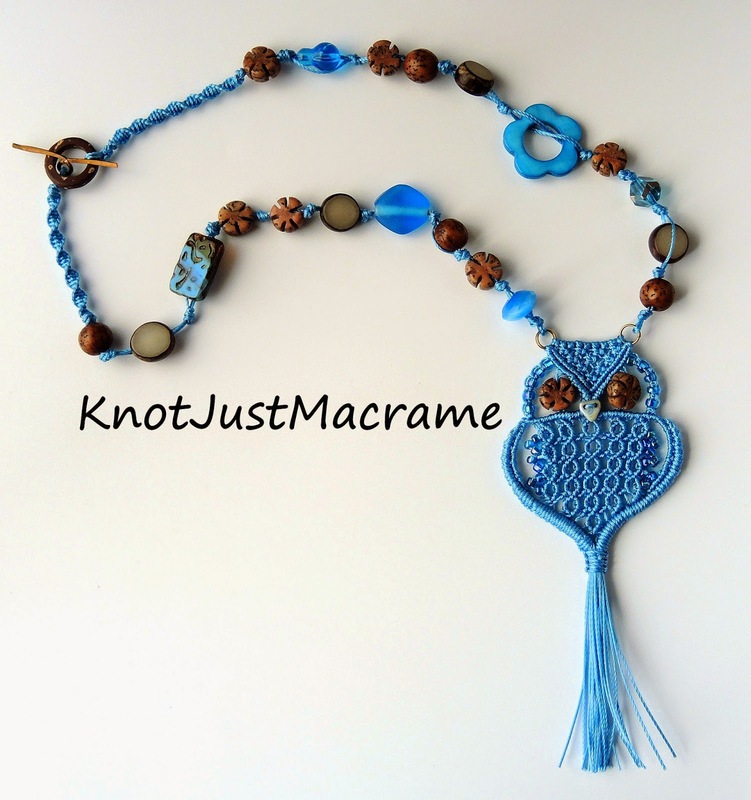 The bright blue cord and glass beads really glow when paired with the natural browns of the seed beads and the solid color body seems to show off the knotting more. He looks like he has on a knitted sweater, don't you think? I think they are both fun necklaces! I ended up submitting the solid blue one for the Bulahan Beads Design Contest since I think it shows off those beads a little more. 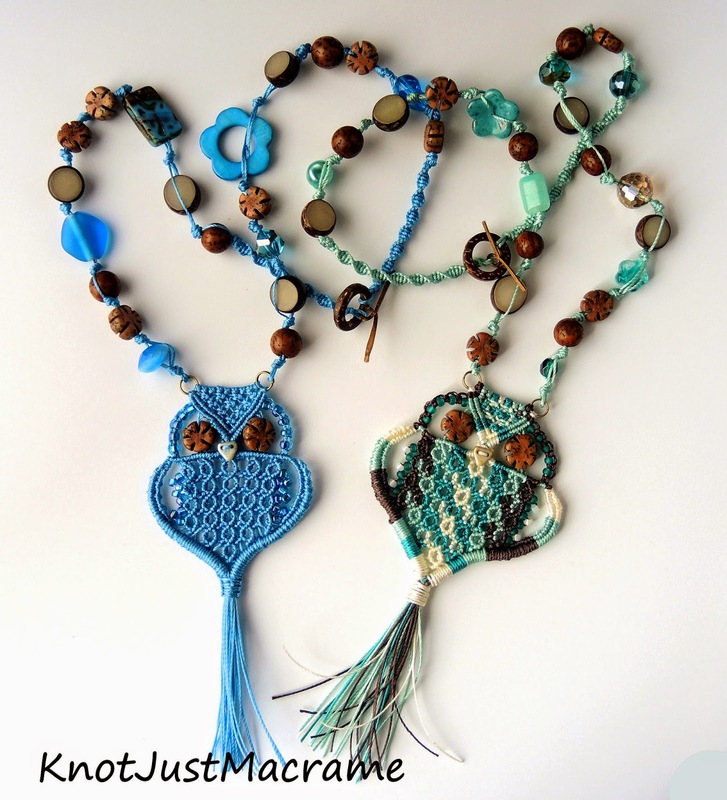 If you'd like to vote in the contest, Antelope Beads has a photo album here. They're asking that you look through all of the designs in the album and pick your top three, then leave a comment here with the letters of your top three before midnight on Wednesday, June 25th. If you share the album, you will have a chance at a $50 shopping spree at Antelope Beads, too! This is the second time I have not been able to post. I love the owls and the beads are just right. I just started my owl last night. I voted and hope you win. Thanks to you I have discovered Antelope Beads. Your owls are really beautiful, do you have instructions on how to make them? I would love to make one for myself.